After Breakfast, They Went for a Ride on their Bikes. First, my friend Erika got hit by a car while riding her bicycle to a lunchtime meeting. Please join me in wishing her a speedy recovery. 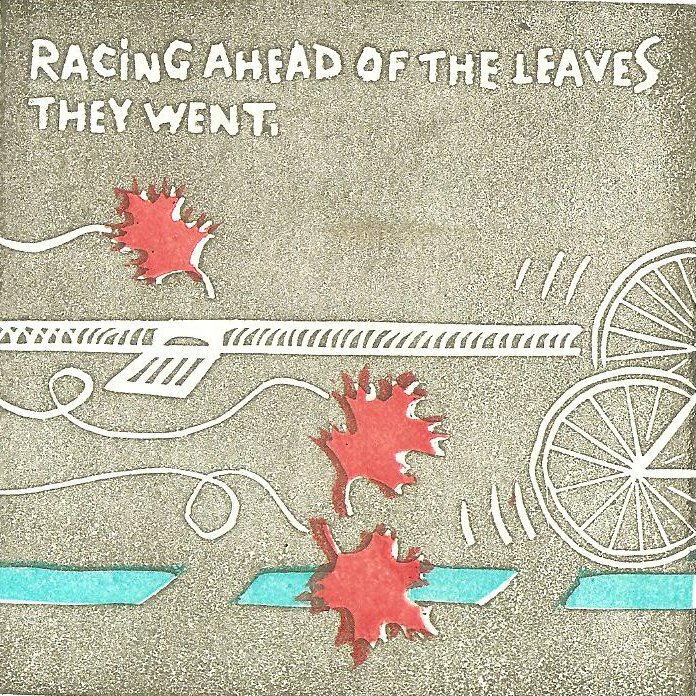 Second: a whole lot of people’s favorite bicycling comic, Yehuda Moon and the Kickstand Cyclery, officially ceased publication as of yesterday. 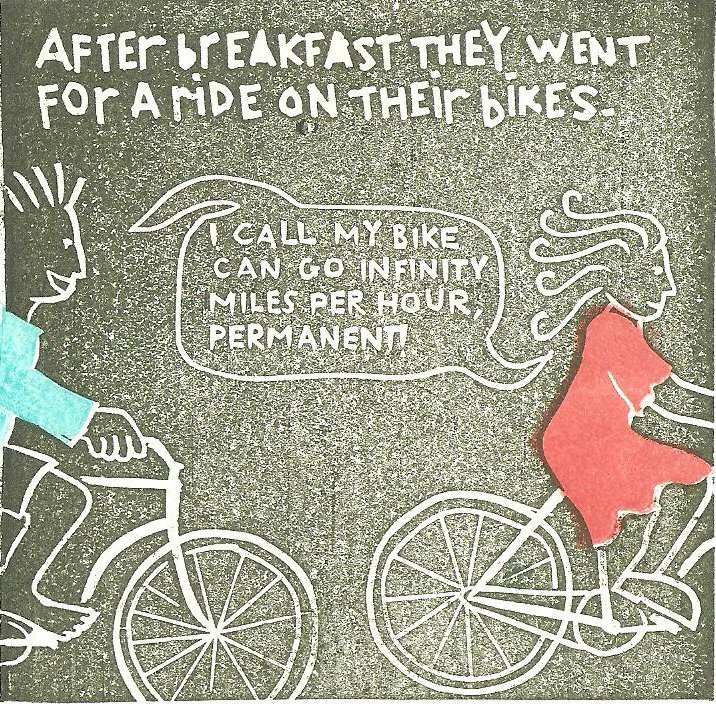 For the unfamiliar, the strip attracted a worldwide audience with its deep understanding of cycling culture, especially the range of different cycling communities, and how they so often disagree. The Cleveland-based creator, Rick Smith, announced a hiatus a few weeks ago, and then yesterday posted that the Kickstand was closed for good. Please join me in thanking Rick for years of insightful humor and engaging stories. Best wishes to him, as well. For both of those reasons, I’m posting something happy. 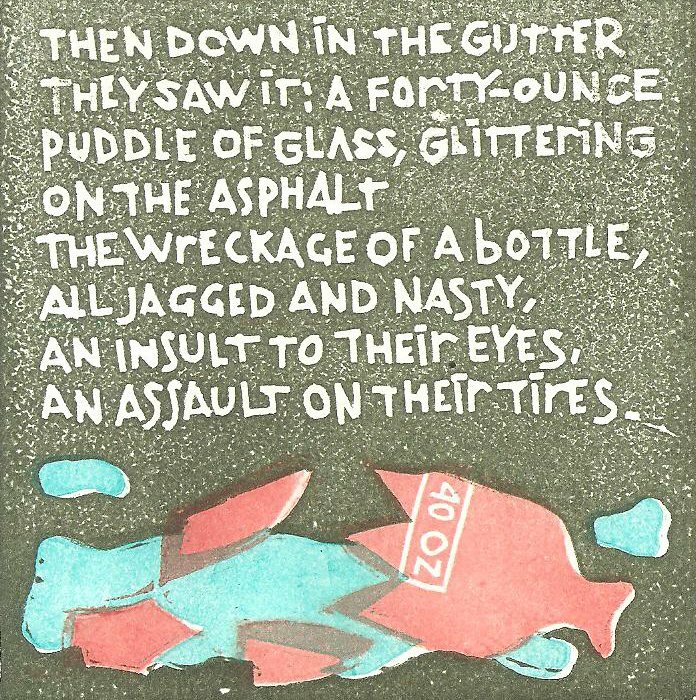 These are scenes from Clam Boy and Big Sister Kitty Begin: Or, The Forty-Ounce Puddle of Glass, a little children’s book I made, in which a boy and his sister go for a bike ride and come upon a broken bottle in the road. As any cyclist or other human knows, a broken bottle in the roadway is not only an insult to the eyes, but also an assault on the the tires. But the boy and girl don’t just leave it for someone else. By cleaning up the mess, they discover that they have super powers that can help make the world a better place. I billed this as “two young patriots’ coming-of-rage story.” And sometimes it feels that way when you see a mess someone else made and left behind, tarnishing your neighborhood as if that didn’t matter. But really, it’s not a story about rage. Really, this is about making the world a better place, and realizing that individuals–even little ones–have this in their power. Raise your hand if you’ve had this feeling: You’ve taken responsibility for something–someone else’s mess, or some kind of communal neglect–and by taking responsibility, you felt empowered. Riding bicycles has that effect, too: you take responsibility for your own transportation, and it helps you realize just how capable you are. You go where you want, when you want, without buying gas or waiting for the bus. You do something most people think is just too hard. But your secret is that it’s fun, and it makes you feel good. No matter your station in life or your politics, when you ride a bicycle, you get out what you put in. You work harder, you go faster. Or you take your time, and you enjoy the scenery. You pour your energy into them, and out comes joy and transportation. At least, until someone whacks you with a car. But I hope Erika and all of us will remember that incidents like these are extremely rare. For most of us commuters, months go by without any hostile interactions with people who drive cars. The empowerment we feel riding bikes helps us get back on them, too. We remember, I think, that we ride our bikes because we personally get something out of it. It’s not so much about saving the world. We do it for the feelings of balance and speed. The invigoration of exercise. The knowledge that we will not get parking tickets. The knowledge that we can get there all by ourselves. And if by getting around on bicycles we pollute just a little less, so much the better. That’s what Clam Boy and Big Sister Kitty are about: knowing you have the power to go, to be, to do. You put yourself at risk when you take responsibility for something, but the risk comes with rewards. My kids invented Clam Boy and Big Sister Kitty as super heroes. I stole the characters and wrote their stories. This bike ride scene is from the second book–a prequel–which gives their origin: how they got their superpowers and assumed their new identities. The first of their stories, Clam Boy and Big Sister Kitty Liberate the Tree and the Sun and the Moon and the Entire Landscape–is about how they cleaned up the scenery after one of those blue plastic grocery bags got caught in a tree (and stayed there, “tarnishing the sun, and darkening the moon, night after day, for weeks on end”). These books are how I started printmaking. 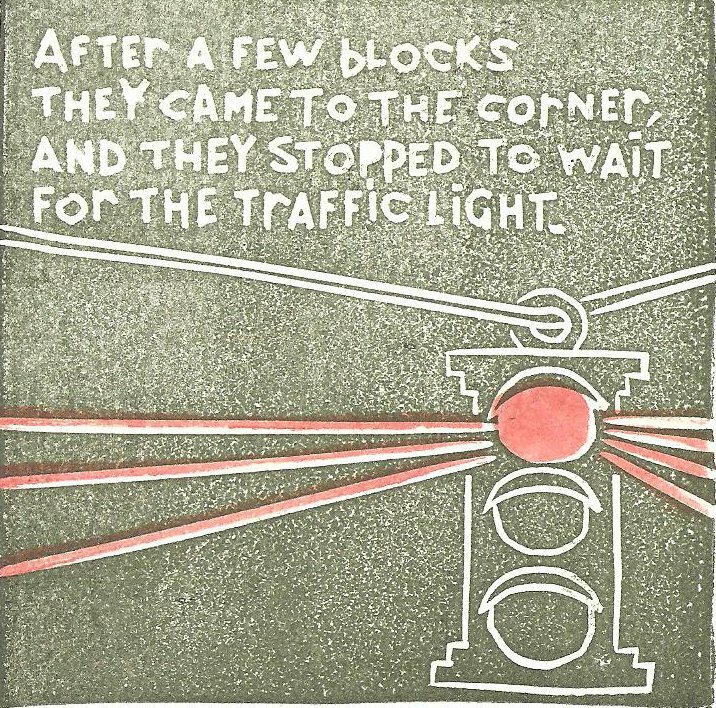 They’re both printed from hand carved linoleum blocks–separate blocks for each color–and bound by hand. You can find them –and learn the rest of the story–here. All of us have super powers. It’s just a matter of using them. When was the last time you used yours? My mid life crisis rides an old French bike. One "High End" Peugeot from the '70s. “We take old bikes and put them back into use so that they’re not what they were originally, but something tailored to the way the buyer rides,” Rychak says. Old bikes are more popular than ever right now, and Blazing Saddles is building a business on that market. The appeal of old bicycles is difficult to explain to someone who doesn’t have it. They are durable. They’re recycled. In an industry driven by a steady stream of shiny, new, must-have products, they have endured. 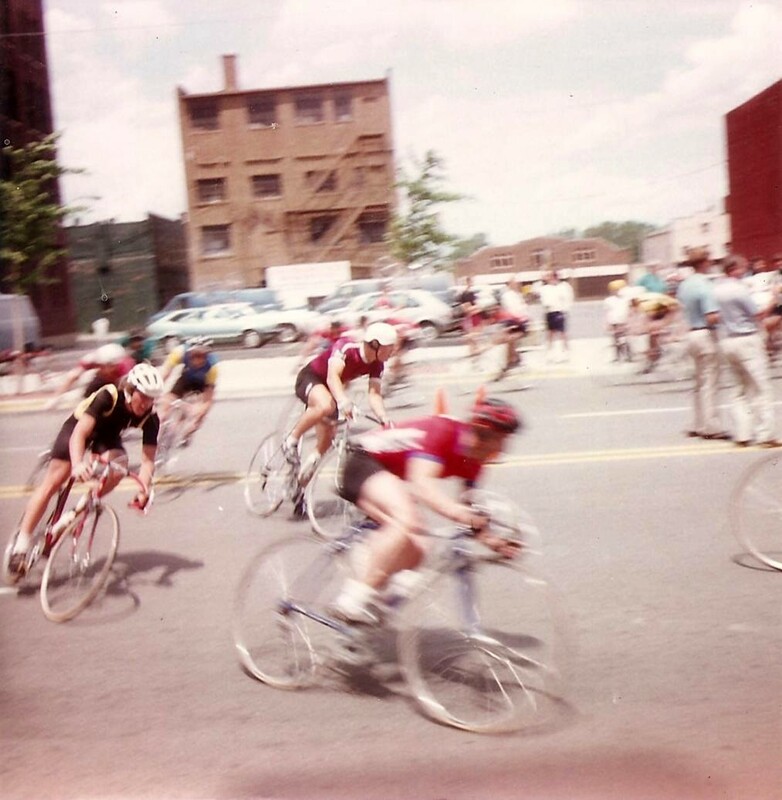 My love of bicycles was born while I was in high school, at the peak of the ‘70s bicycle boom. At that time the finest bicycles in the world were still made of steel—hand crafted, chrome molybdenum or chrome manganese tubes braised together with curvaceous lugs. 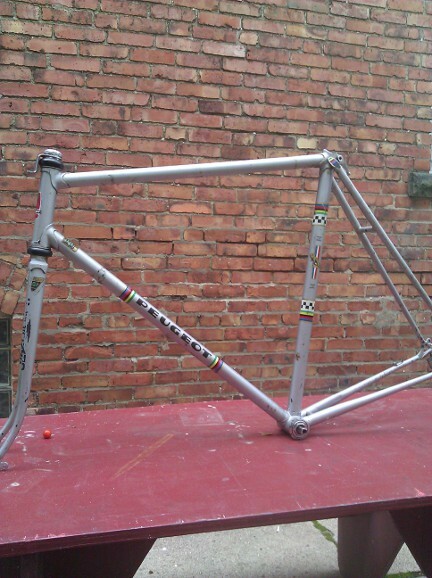 Craftsmen built the best of these frames one by one, and master frame builders put their names on them. These days the fastest bikes are made of carbon fiber, and new, hand made steel frames occupy a niche market, fed by folks like Cleveland’s Dan Polito, and Joe Bringheli. 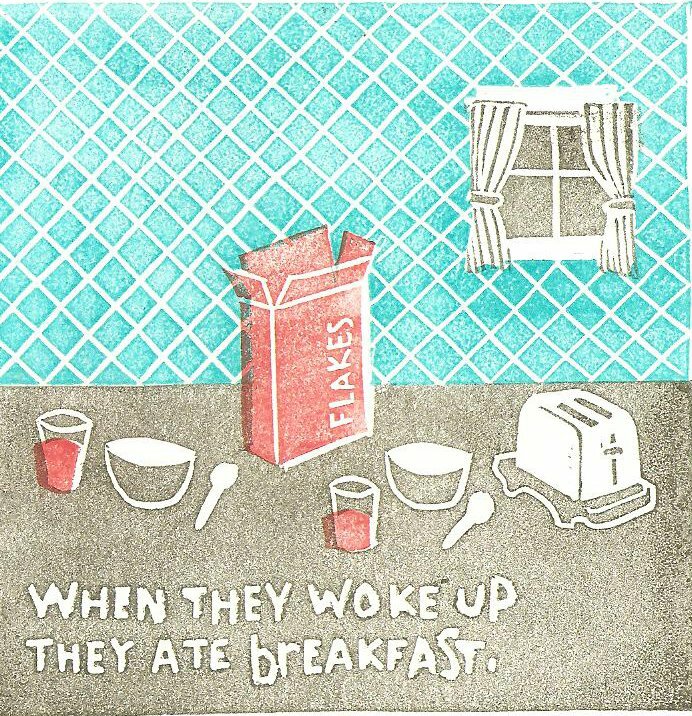 But that’s another story. I’ve owned a couple of fine steel bikes, and pedaled them tens of thousands of miles. 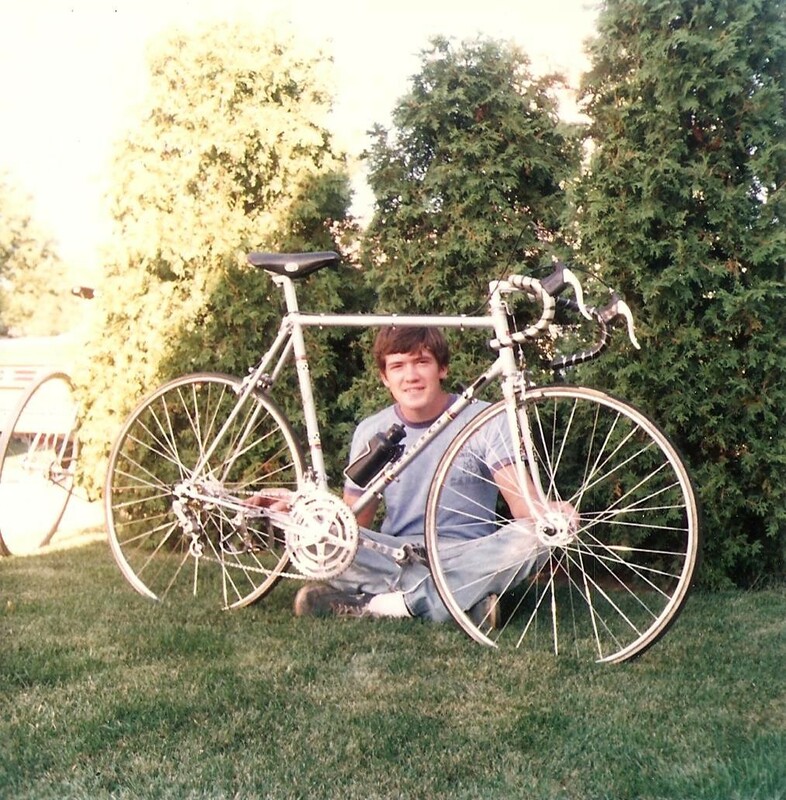 My first serious racing bike was a Peugeot with a Reynolds 531 steel Frame and sew-up tires. I bought it from Heinze Linke’s shop, the Madison Cycle Center, on Madison Avenue in Lakewood. Heinze worked at NASA by day and opened his bike shop in the evening. He was a godfather of bicycle racing on Cleveland’s west side. His shop had posters of Eddy Merckx and Bernard Thevenet, the biggest names in cycling at the time. Its racks were filled with fine racing machines. Anyone who has put in more than a few hundred miles on a bike like that knows this is true: It’s one thing simply to own a beautiful, hand crafted object, but it’s quite another to ride it, feeling the way it transmits the road to your muscles, the way it responds when you jump. That's me in the middle, sporting the burgundy jersey, because the Cleveland Wheelmen had signed on to the notion that "Cleveland's A Plum." I joined a racing team, the Cleveland Wheelmen. There were races in Detroit, Windsor, Akron, Canton, Dayton, Buffalo, and more. One year I got some black alphabet decals and put CLEVELAND on the front of each of my fork blades. My training logs show I rode that bike more than 30,000 miles. It would have been about 1985 when I sold it. Fast forward to 2011. I’ve been commuting to work for almost a decade, but lately I started riding fast again. I’m out of shape, but having a ball, and it makes me miss that bike. So a few years ago I took up the habit of prowling Craigslist to find old bikes that awaken the joy that old Peugeot and a few other bikes had kindled in me. That’s what brought me to Blazing Saddles. Rychak put the frames up on the counter. One was too big. No sense looking at that. But the other one, well, there was no way to deny that it happened to be the same make, model, year, size, and color as my old Peugeot. Rychak told me the bike I was looking at came to Blazing Saddles from a guy who got it from his father. There were chips in the paint, and specks of rust, but only cosmetic damage. I almost immediately noticed some flaking decals on the front of the fork blades, and I knew what they meant. But it didn’t sink in until I turned the frame toward me, so I could make sure everything was still straight and true. Those flaking decals on the front of each fork blade were the remains of of what I had put there almost 30 years earlier: black helvetica letters spelling out CLEVELAND. This was my bicycle. Not just the same make, model,year, size, and color but the very same bike I had pedaled all those miles. Those Cleveland decals were proof as good as a notary stamp. Since I sold this bike, Ronald Reagan completed his presidency. So did George H.W. Bush, Bill Clinton, and George W. Bush. Now Barack Obama is in the White House, and nearly thirty years after the last time I saw my bike–I had the chance to buy it back. I paid the asking price, without even an attempt to bargain down. Now my old Peugeot –the frame, at least–is hanging in my basement, waiting for me to scrape together cash and make good on my commitment to restore it. It feels like I’m on a mission, to track down the rest of the components that once made it such a beautiful machine. This could take years. I’m not in a hurry. Anyone know where I can get a set of Maillard 700, high flange hubs? Ingenuity grooved on re-invention this year. That’s heartening for a city with so much in the way of abandoned and obsolete raw material. Figuring out new ways to use our old stuff is a kind of ingenuity Clevelanders get, deep in our souls. We garbage pick. We shop thrift. We rig stuff up. Not to short change cutting edge technology. Cleveland has that, and so did Ingenuity, 2011. 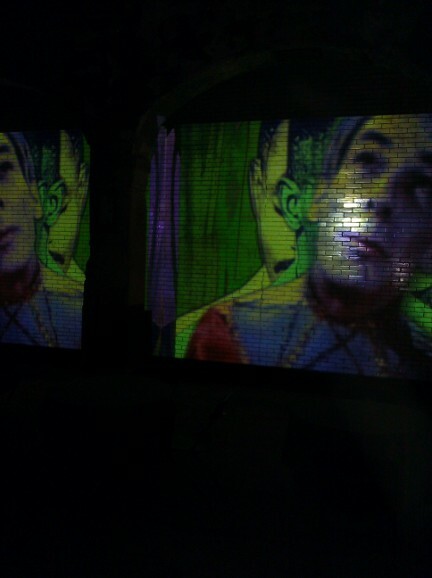 How could you not love Kasumi’s mind blowing video, projected on the white gloss of a glazed tile subway platform? The Guggenheim Award-winning artist-and Cleveland-Institute-of Art-prof’s use of video is a psychedelic exploration of the medium as raw paint. It’s also cultural documentary, twisted with humor, a disturbingly fun look at where we’ve been and what we’re becoming. Her collages combine video sources, from her own original material to public domain footage, and re-mix them. We’re accustomed to the rhythmic, satiric, irresistible effects made possible in sound by hip hop artists. Kasumi does that with video. Can we pause for a moment, just to marvel at the bandwidth? 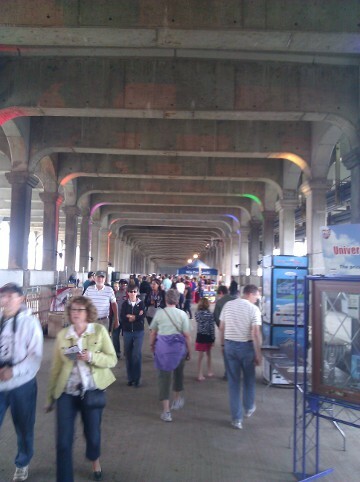 Remarkable as the tech installations may have been, the festival itself has re-invented the forgotten basement of a half-mile long bridge. Ingenuity gives big, new life to an obsolete structure in a city plagued by thousands of “obsolete” homes. Maybe we should consider those houses a resource? This kind of ingenuity speaks to us on a completely different level. What other city holds an art and music festival along a half mile span that soars more than 100 feet above a river valley, while thousands of cars a day still roll overhead? Is there any cooler festival venue in the United States? Drip some of that mojo on our abandoned factories, would you please? Beyond the venue, re-invention –or, as the developers would say, “adaptive re-use” –made its way into the festival’s programming this year in a big way. 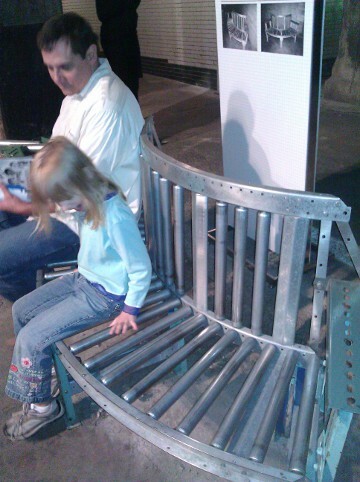 Consider Chair and Tell, an exhibit of seating put together by artists using supplies from industrial resale shop, HGR. Dana Depew made a chair out of old conveyor rollers. For the unfamiliar, HGR sells old machines, shop fixtures, and other used supplies from Cleveland’s manufacturing plants. Sometimes the equipment is just old. Sometimes the company that once owned it went out of business. You want to buy an old fork lift? This is the place. You want a metal lathe, or an arbor press, or a drill bit to bore big holes in concrete? Come browse the aisles. For Chair and Tell, artists including Kevin Busta, Dana DePew, Stephen Yusko, and Grant Smrekar took parts from old industrial equipment, cut, welded, and re-arranged it into chairs. DePew made one out of rollers from an old conveyer system. Busta’s used drive shafts with universal joints as legs. Yusko cut up, re-arranged, and re-welded a pallet jack. printing plates were carved plywood. They’d ink it up with a hand roller, lay over it a sheet of paper and some felt blankets, then lay it all on the floor beneath the rocking horse. 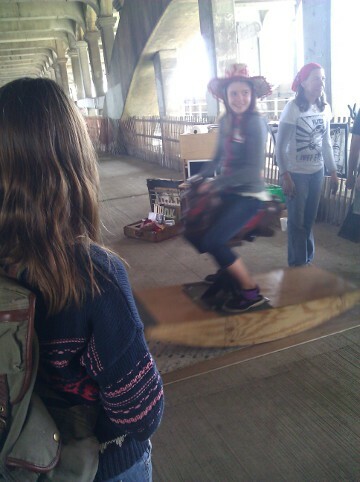 Then a kid would climb on board and rock on the horsey’s one, wide rocking panel. A few times back and forth, and they had rocked out a woodcut print. Sunday afternoon, about 3 p.m.
Loads of local, original bands kept the place kicking. Even Sunday afternoon at 3 p.m. the place was full of people and energy. Ingenuity’s leadership has gone through some re-invention this year: With founder James Levin no longer at the helm, the festival is at a critical point in its evolution. For organizations run by their founders, the transition to a new director is always a tough time. And whether Ingenuity will continue to thrive remains to be seen. But this festival–including the bridge as its venue–deserves to outlive the tenure of the person who had the idea. If this year’s event was any indication, executive director Paula Grooms and director of programming James Krouse have it off to a good start. The Bike Rack is located in a pretty good neighborhood. 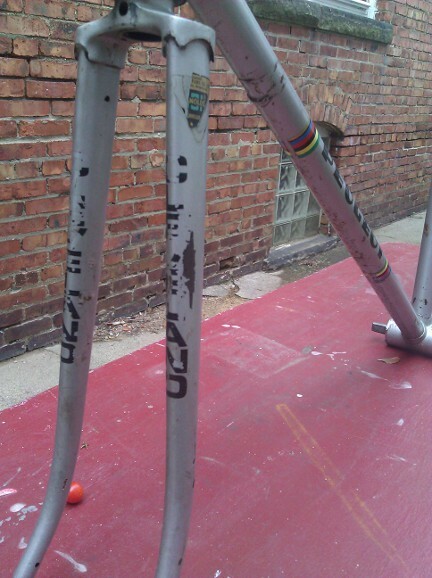 I’m rooting hard for the success of Cleveland’s Bike Rack. I’m talking about the capitalized, proper noun Bike Rack–not any little twist of metal you see on the street for parking your bike, but the purpose-built, $600,000 facility in the Gateway neighborhood. It’s been open a couple of weeks now, so for bike commuters and anyone who pays attention to Cleveland transportation issues, this is old news. I visited the place Aug. 25, during its open house, a day before it opened. I’m writing this on the second day of the Cleveland Bike Summit because I’m hoping to bring it back to your attention after that initial flash of news coverage. Bikes take up less parking space than cars. 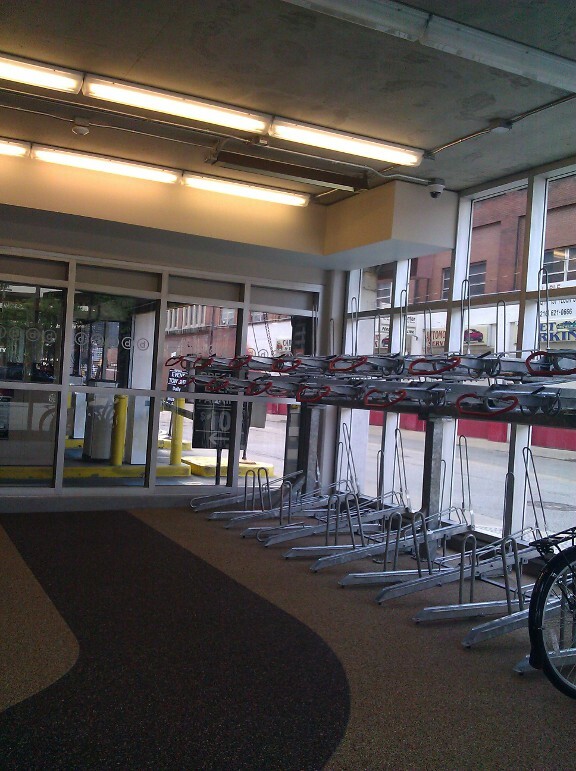 That price tag might sound staggering: half a million dollars to provide bicycle parking for 50 bicycles? Of course it is more than that: There are lockers, comfortable shower facilities (which you need if you want to look fresh and pressed for work), towel service if you want it, a repair shop, and an attendant on duty. But the price tag is exactly why I say I’m rooting for the place. Because loaded in that statement is the knowledge that they are in a battle for their own sustainability. If you’re rooting for something, you’re acknowledging the possibility that they might lose. And this place has to demonstrate return –whether in dollars, political capital, or just positive buzz for the city–on a pretty big investment. On the one hand, the price tag comes with a commitment. You don’t invest more than half a million dollars on a whim, or on something you’re not committed to. But on the other hand, a realist has to acknowledge that the Bike Rack is located on expensive real estate in a neighborhood with big development plans, and the number of people riding bicycles to work is still pretty tiny. Cleveland has made great gains: ten years ago, when I commuted from Lakewood to the Free Times offices in Cleveland Heights, I might have seen one or two other commuters along that route. But in the last year, on a commute to downtown, I could count on seeing a dozen. And with a few more bike lanes, with something like 500 (lower case) bike racks installed on the sidewalks all over downtown and in neighborhoods, the city is treating its cyclist population much better these days. Still, the number of people getting to work on two wheels remains tiny. The Bike Rack faces some changes ahead, too. 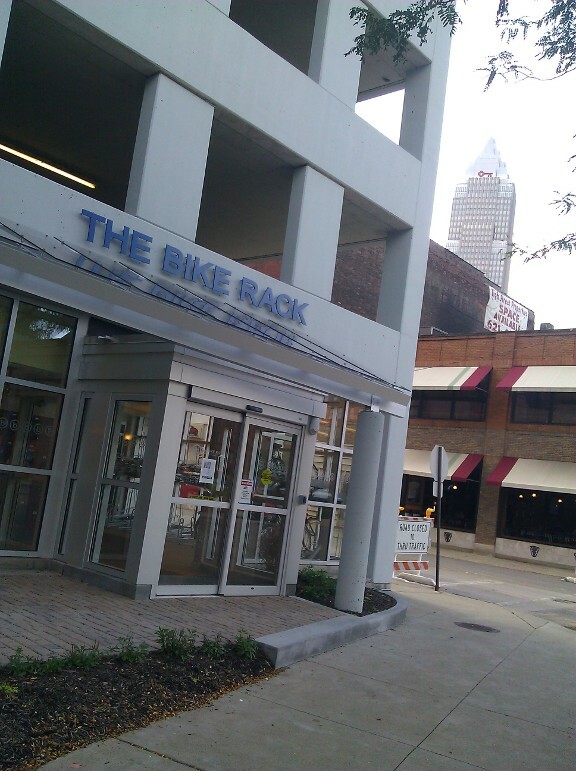 The city owns the place, but as Tom Breckenridge reported in the Plain Dealer, ownership will transfer the Gateway North Garage (where the Bike Rack is located) to casino developers. The new owners will then lease the facility back to the city for $1 a year. Through ownership changes, an annual lease, and inevitable political shifts, the only way the Bike Rack will keep its place downtown is by attracting plenty of cyclists. It has to fulfill its promise. “Biking, it seems, is an uphill ride, due largely to mathematics and a sort of Catch-22: with only a small percentage of Americans using bicycles as their primary method of transportation, there’s no huge public outcry for — or immediate political benefit to — remaking city streets so that they’re a little less friendly to cars and a lot more hospitable to bikes. But without that hospitality, primarily in the form of better bike lanes and more bike racks, biking isn’t convenient and attractive enough to win all that many converts and thus a political constituency. So if you value the Bike Rack, use it. If you have considered biking to your downtown job, but you need to arrive clean and well dressed, try it out: The showers are nicer than the ones in my house. And for a $25 a month membership, it’s a ridiculous bargain. To get a parking deal like that for your car, you’d have to park down in the Flats somewhere, and you wouldn’t get a shower as part of the bargain. Even with facilities like the Bike Rack, if cycling is to grow as a transportation alternative—to gain the respect of motorists, to burn less gas, to make neighborhoods more pleasant places to be—the most important infrastructure is human. 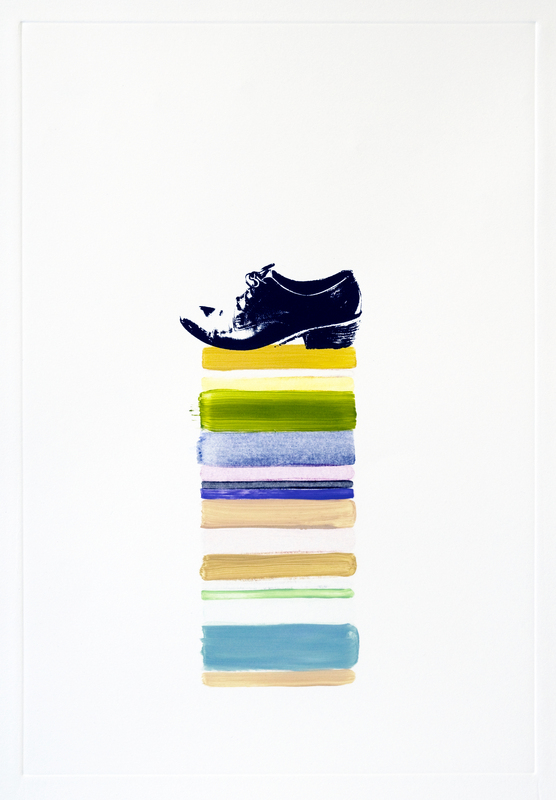 Work by local artists--such as the above screen print and monoprint, "Friday," by Zygote's 2011 Artists in Residence Dana Oldfather--is what most often is forgotten in the dearth of media attention to the arts these days. Oldfather's show, GIVE US A FENCE AND SOME ROOM TO RUN, opens with a reception from 6 to 9 p.m. Friday, Sept. 9 and hangs through Oct. 23, 2011 at Zygote Press. First, it must be said (in the way that people say such things) that this Liz Maugans woman cannot be stopped. 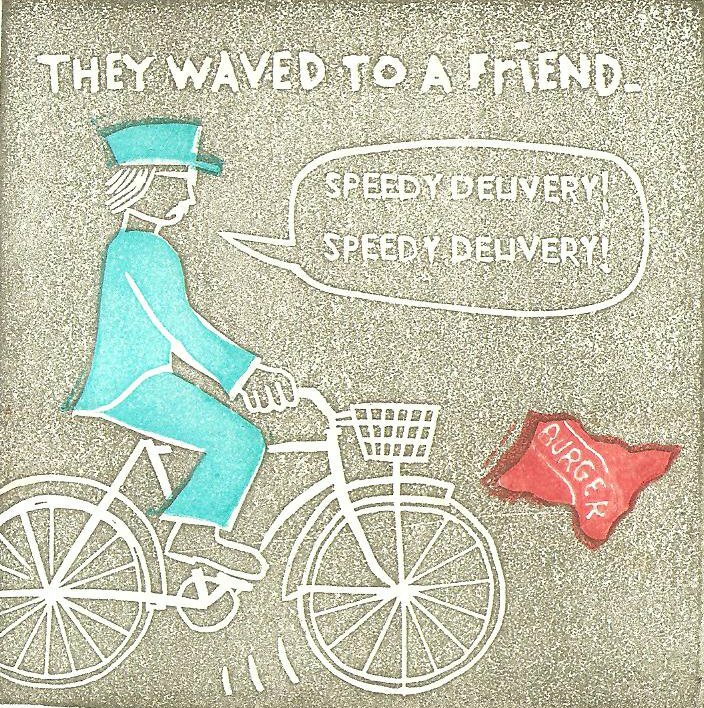 If you are reading this, odds are you are familiar with Cleveland-based printmaker and Zygote Press director Liz Maugans. It seems she cannot keep herself from dreaming up ways for Zygote to reach out. Reaching out is how arts organizations keep themselves going—by finding new audiences, building new partnerships, or discovering new ways to stretch meager resources. In recent years, Maugans’ efforts along these lines have been both to find new audiences (by educational efforts as well as traveling shows), and to create ways for arts organizations to help each other and themselves. It’s the latter that has my attention here. Some of the people reading this probably took part in the Zygote-sponsored SALT Talks (Sustainable Arts Leadership Talks), which in the wake of the economic meltdown gave small arts organizations a forum to strategize about how to survive in tough times. Her current project is an extension of that effort. Maugans knows that for arts organizations to thrive, they have to communicate. Arts leaders must talk not only amongst themselves, but they have to get word of their activities out to the rest of the world. This has become more and more difficult, thanks to the steep decline in arts coverage by the media in recent years. A multitude of papers that used to cover the arts in general and visual arts in particular have gone by the wayside. Forget about the Cleveland Press. If you’re 30 years old or less, you never saw it anyway. But remember Dialogue Arts Midwest? 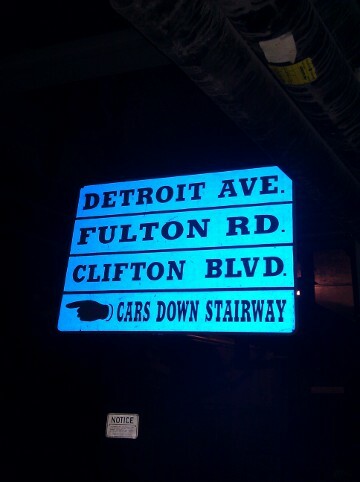 We also had Avenues. And Northern Ohio Live. And the Downtown Tab. And Urban Dialect. And Angle. And Artifact. And the Free Times. Even Scene used to review shows every week. Not anymore. Not long ago, the Plain Dealer led the local conversation about the arts’ benefit to neighborhoods and the regional economy. For years a reporter covered that as a beat. Features about local artists’ work and organizations’ projects were routine. Shows at small galleries were reviewed. Arts coverage had its own section 7 days a week. 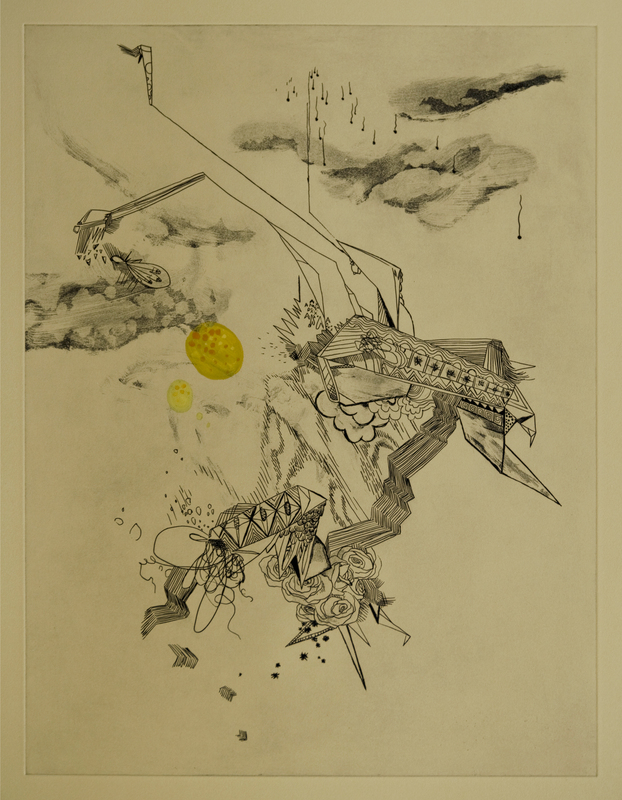 A self-taught painter who hadn't previously learned printing techniques, much of Oldfather's work at Zygote was a significant departure from the line and compositional style in her more familiar paintings. 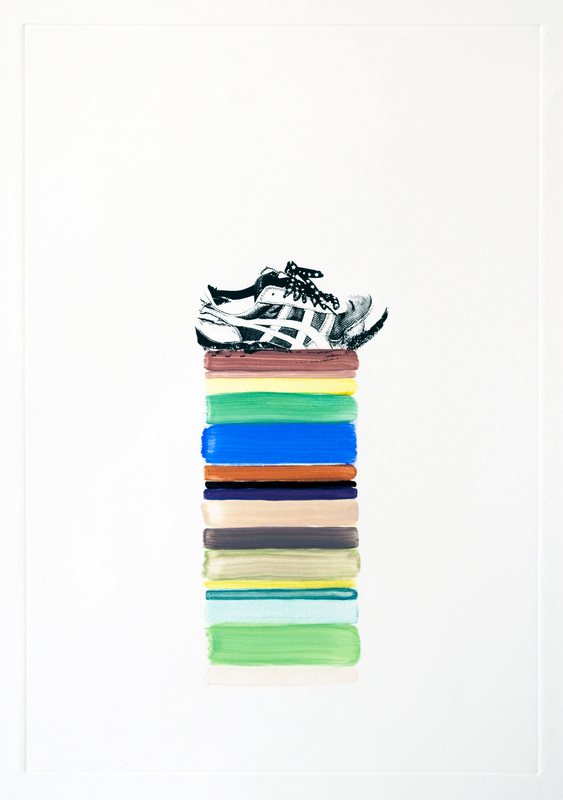 This piece, "Saturday," is another screen print and monoprint. But a combination of buyouts and editorial decisions has slashed the PD’s local arts coverage to just three days a week, with the occasional scrap of a human interest story thrown in now and then. You can always find coverage of TV stars and other celebrities. The Cleveland Orchestra and a few other major institutions makes routine appearances. But as far as work done by smaller organizations or individual artists, you hardly find a peep. The irony is that all this happened just as the region took ownership of the idea that the arts matter to the well-being of individuals, the vitality of neighborhoods, and the regional economy. Just as the county electorate decided by vote that art matters enough to merit public subsidy, the coverage went away. In this atrophied landscape, no medium has suffered as much as the visual art scene. So, having watched all that happen, Maugans knows that if places like Zygote want coverage—or Bay Arts, or William Busta Gallery, or SPACES gallery, or Wall Eye, or Legation or Arts Collinwood—they have to become the media. That’s a phrase typically associated with electronic media, which is indeed fast, contagious, accessible, and cheap. And indeed, many arts organizations already use it to some degree. Still, that doesn’t have the same impact or presence as print. And so Ms. Maugans conceived a newsprint publication generated by the organizations themselves. She applied for a grant. She got funded. And she began to recruit peer organizations to join the effort. Thus the Cooperative Arts Network Journal was born. Monday Liz and I met with about a dozen participating galleries and other organizations that will be a part of the project. About 22 are committed so far. CAN Journal will be a printed introduction to the galleries and other visual arts organizations sprinkled around the Cleveland area. The people who run the galleries will be the reporters: they’ll interview each other and write profiles of their colleagues’ venues. I have the pleasure of editing their work, and working with my former Free Times / Scene colleague, art writer extraordinaire Douglas Max Utter. CAN Journalwill be distributed at participating galleries. It’s a one-time resource for now, but could become annual. This etching and monoprint, "The TIme Machine," has in its lines more familiar aspects of Oldfather's compositional style. This is how the arts community looks after itself. This is pulling yourself up by your bootstraps—with a little help from the Ohio Arts Council, of course. This is the kind of thing that all of Cleveland—not just the arts organizations—must do: If you need a tool, make it yourself. Yes, you CAN. You can follow Collective Arts Network Journal on Facebook. 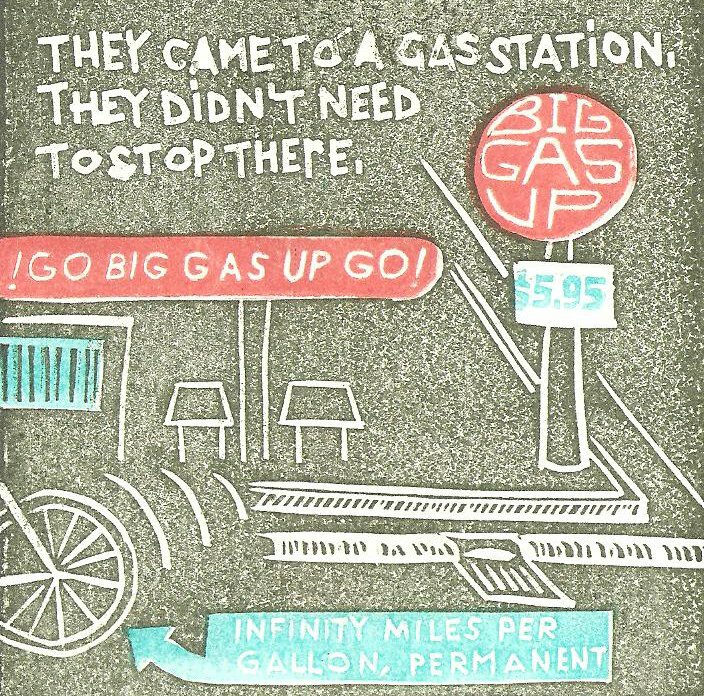 You can learn more about Zygote Press at Zygotepress.com.